The Koch network has invested heavily in lobbying to directly assert their influence on the state’s policy agenda. Since 2010, the Kochs have spent $2.6 million lobbying on dozens of pieces of legislation to further their corporate agenda at the expense of Wisconsin’s workers, environment, students, and families. In addition, the Koch astroturf network has been on the frontlines fighting for some of the most regressive political efforts in Wisconsin in recent years. They pushed for devastating anti-labor efforts including the silencing of workers, eliminating the prevailing wage, and preventing a raise of the minimum wage. The Koch-backed ALEC created dozens of pieces of boilerplate legislation, many of which have been incorporated into Walker’s radical education agenda. They fought tooth and nail to turn the state against healthcare reform and block the implementation of the Affordable Care Act. And finally, to protect the full profit-generating capacity of their Wisconsin operations, the Kochs have railed against the EPA and renewable energy development while simultaneously praising the Keystone pipeline and open pit iron mining. 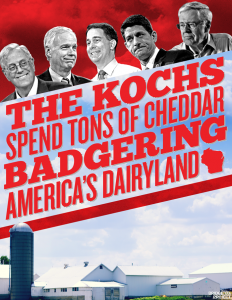 Absolutely nothing in Wisconsin could deter the Kochs from their selfish objectives. Their agenda proves that they are willing to compromise the lives and livelihoods of Wisconsin families, and their record shows that they would even stoop so low as to malign Native Americans and target minority and student voters in fraudulent schemes to achieve their full objectives. Click here to read/download the complete report.